10702 Jasper Ave, Edmonton, AB, T5J 3J5. Refreshments will be served. Click here for location and further details. Presentation, book sales & signing. Light refreshments. Free event, everybody welcome! Canadian Congress of the Humanities and Social Sciences at The University of British Columbia with Association of Canadian College and University Teachers of English (ACCUTE), the Association for Canadian and Québec Literatures (ACQL), and the Canadian Association for Theatre Research (CATR) . The iGiselle development team members will present at a colloquium. 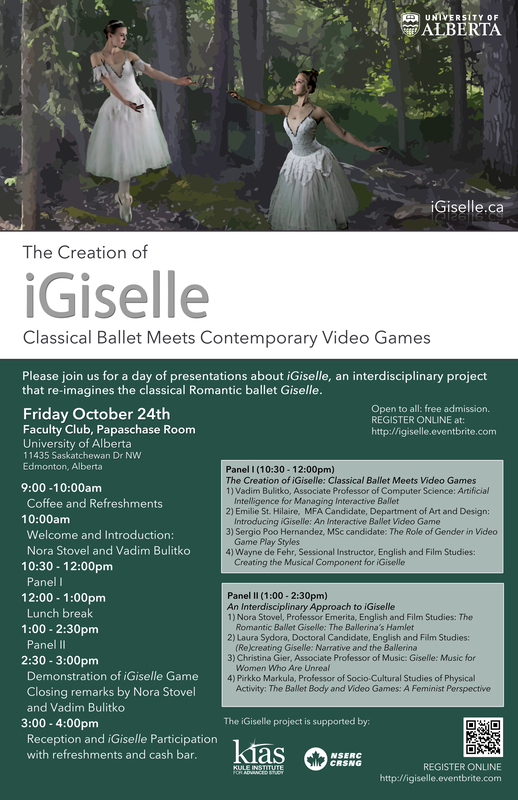 Emilie St.Hilaire will present iGiselle: An Interactive Ballet Video Game at the GFX panel. Grace Hopper Celebration of Women in Computing Conference. Phoenix, Arizona, USA. Sarah Beck, Vadim Bulitko, Sergio Poo Hernandez, and Emilie St.Hilaire will give a presentation about the iGiselle project. Interactives Group. University of Alberta. Edmonton, Canada. We are not responsible for the advertisements that appear on this free WordPress site. Thank you for your understanding.